Did you see all the savings going on this week in the Tripawds Featured Blogs? 😮 It’s not too late to save on the best Gear, Gifts and Downloads! Three is a magic number, so you have three more days to take advantage of savings in three Tripawds stores! Use Coupon Code “3OFF” to take $3 OFF your purchase in the Gear, Gifts and Downloads blogs. Tripawds Gear Shop = $3.00 Off Every Item! Read the Tripawds Gear announcement for details. Tripawds Downloads Store = $3.00 Off all E-books! Read the Tripawds Downloads announcement for details. Tripawds Gifts Shop = $3.00 Off all Jewelry! Read the Tripawds Gifts announcement for details. This offer is valid all weekend. Coupon code 3OFF applies to select items in all three Tripawds Featured Blogs and expires at midnight on Cyber Monday, November 26, 2018. 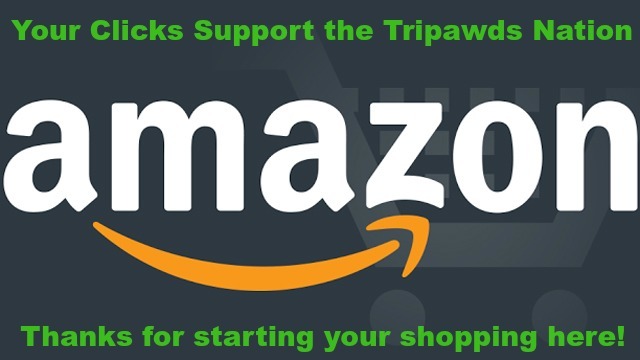 Support Tripawds When Shopping Amazon! Please remember to support your Tripawds community when shopping for Amazon Black Friday Deals. Start your Amazon search here! Got Your 2019 Tripawds Calendars Yet? After all the savings you find this weekend with Black Friday and Cyber Monday deals, please consider paying it forward with a charitable contribution to the Tripawds Foundation when the global season of giving begins on #GivingTuesday. Hoppy Holidays, and Thank You for Your Support!